You might think I’m a crafty person since all I seem to do is “create” colorful things in the world of food. Let me assure you that I am FAR from being a crafty person. Fact: my nine-year-old daughter knows her way around the craft store while I walk around with that lost look in my face. 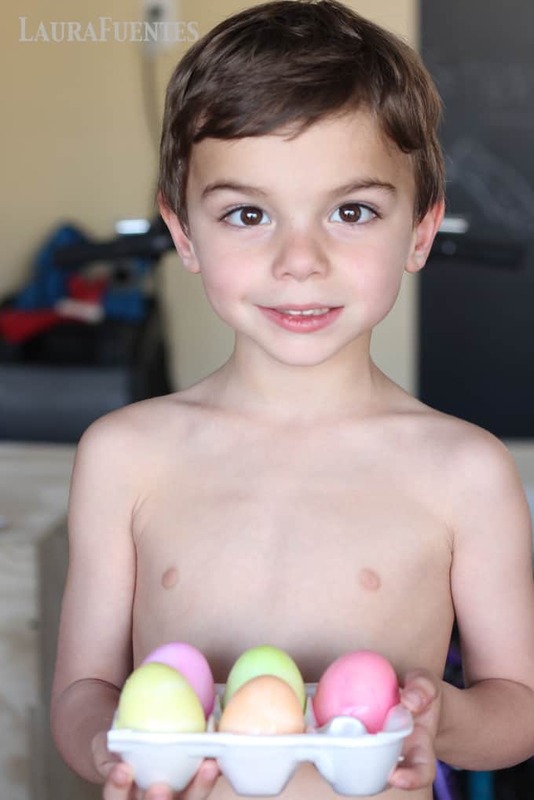 As you can imagine, my kids were thrilled when I suggested that we were dyeing Easter eggs this week. Mom, suggesting a craft activity? No way! Since I am not the crafty one of the family, I typically rely on my daughter to find a craft on Pinterest, make the supply list, and then we all make it together. She happily researches the best way to make it, watches a few YouTube videos, and then she teaches ME how to do it. If it were up to me, we’d be coloring Easter eggs with markers. Because you know, sometimes the natural dyes don’t adhere so well to the eggs. 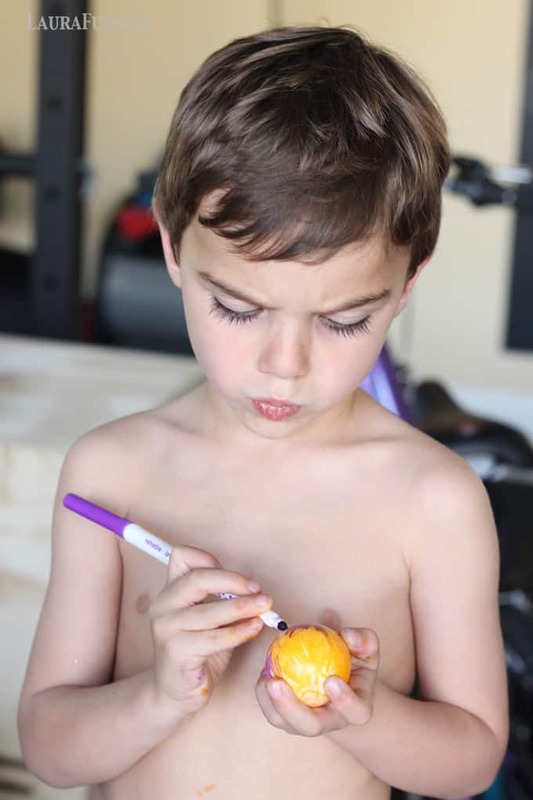 So naturally, I bought one of those “kits” to color eggs that comes with all the cute stickers and glitter that kids love. I have to admit, that I was a bit overwhelmed at first. 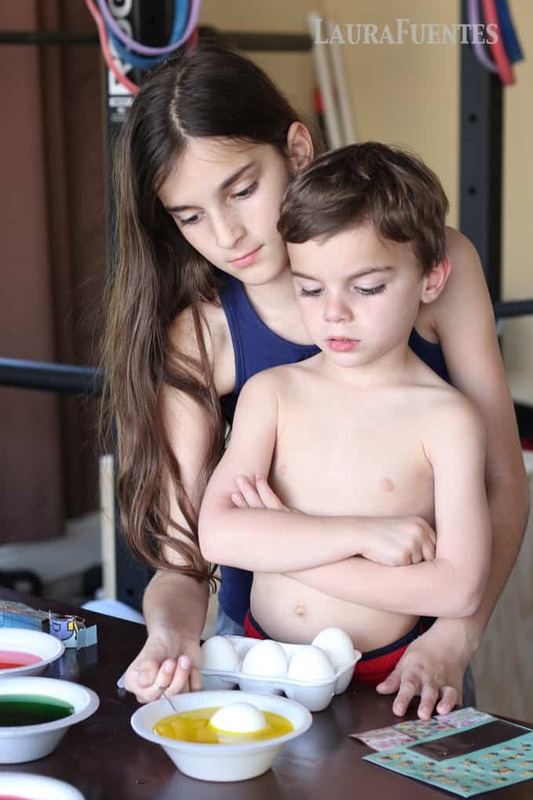 There are a lot of directions on a $2.00 box to dye eggs. If it were up to me, I would use some of my natural food dyes from the kitchen, the ones I use for cupcakes, but I didn’t want to mess things up by not following directions. 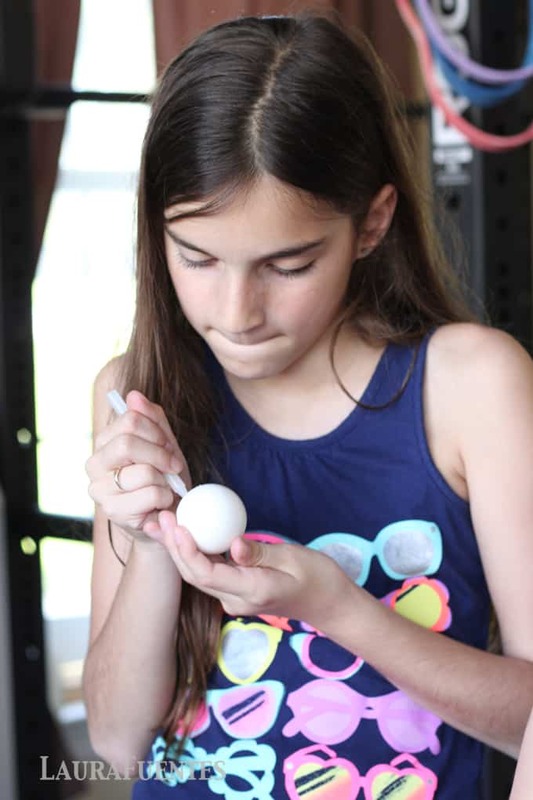 My daughter reminded me to use everything out of the box because I am a pro at cooking eggs that are easy to peel, but not anything else past that. Plus, she had her best friend over so I am pretty sure she wanted the craft to be successful. First, we boiled the eggs, using my How to Boil the Perfect Egg directions. Then I waited until they reached room temperature, and that’s when the fun began. I filled bowls with different colors (following the directions on the box) and then divided the crayons, stickers, cut outs, glitter and more evenly among all four kids. 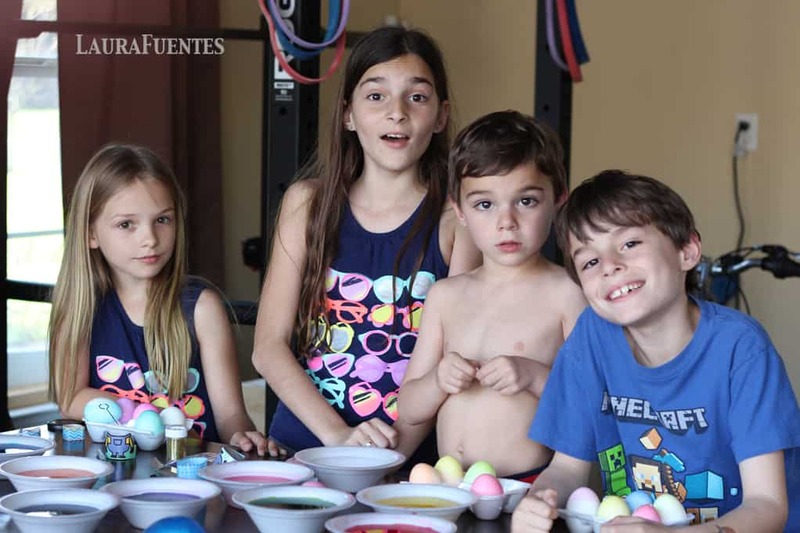 It was an endless array of how to decorate eggs, which, I think the kids could have decorated ten dozen eggs, since the four dozen I boiled seem not to have been enough. 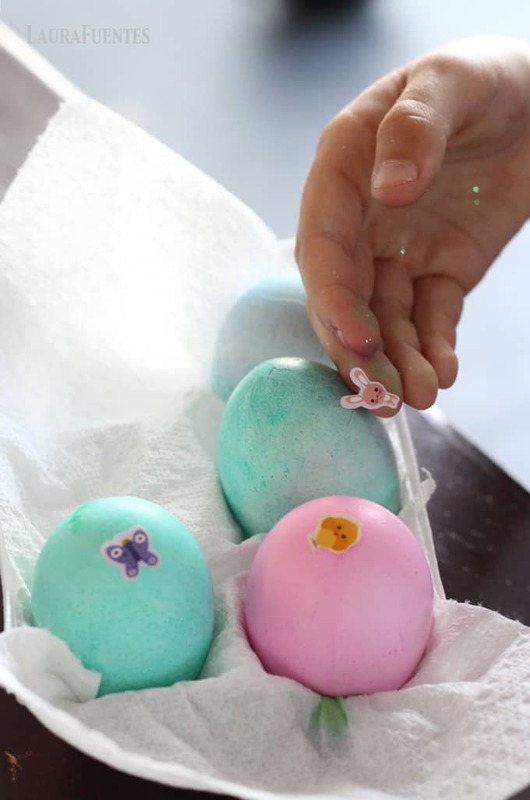 After the activity was over, the kids moved on, and now I have four dozen beautifully painted, stickered, and glittered, eggs in my refrigerator which my husband and I have been eating non-stop all week. Some of my favorite ways to use up hard boiled eggs are in my, my Cobb Salad Bar and Cobb Salad Pizza, Egg Salad, and many more Healthy Office Lunches. What is your favorite way to eat leftover Easter Eggs? Your kids are adorable! So cute. My kids love doing this. They wish it was easter all year long.